Cities: Capital--Vienna (2005 pop. 1.63 million). Other cities--Graz, Linz, Salzburg, Innsbruck, Klagenfurt. Annual growth rate (2006): 0.09%. Ethnic groups: Germans 98%, Turks, Croats, Slovenes, Bosniaks; other recognized minorities include Hungarians, Czechs, Slovaks, and Roma. Health (2006): Infant mortality rate--4.6 deaths/1,000. Life expectancy--men 76.17 years, women 82.11 years. Work force (2005, 3.49 million): Services--70%; agriculture and forestry--3%, industry--27%. Defense (2004): 0.9% of GDP. GDP (2005): $297.7 (@ exchange rate of 1.21:1) billion. Real GDP growth rate (2005): 1.9%. Per capita income (2005): $32,700. Agriculture (1.8% of 2003 GDP): Products--livestock, forest products, grains, sugarbeets, potatoes, wine, fruits. Industry (30.4% of 2004 GDP): Types--iron and steel, chemicals, capital equipment, consumer goods. Trade (2005): Exports--$114.59 billion: iron and steel products, timber, paper, textiles, electrotechnical machinery, chemical products, foodstuffs. Imports--$116.88 billion: machinery, vehicles, chemicals, iron and steel, metal goods, fuels, raw materials, foodstuffs. Principal trade partners--European Union, Switzerland, U.S., and China. Austrians are a homogeneous people; 92% are native German speakers. Only two numerically significant minority groups exist--18,000 Slovenes in Carinthia (south central Austria) and about 19,400 Croats in Burgenland (on the Hungarian border). The Slovenes form a closely-knit community. Their rights as well as those of the Croats are protected by law and generally respected in practice. The present boundaries of Austria, once the center of the Habsburg Empire that constituted the second-largest state in Europe, formed in accordance with the Treaty of St. Germain in 1919. Some Austrians, particularly near Vienna, still have relatives in the Czech Republic, Slovakia, and Hungary. About 74% of all Austrians are Roman Catholic. The church abstains from political activity. 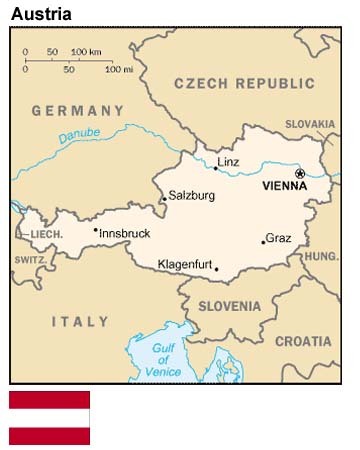 Small Lutheran minorities are located mainly in Vienna, Carinthia, and Burgenland. Soon after the Republic of Austria was created at the end of World War I, it faced the strains of catastrophic inflation and of adapting a large government structure to the needs of a new, smaller republic. In the early 1930s, worldwide depression and unemployment added to these strains and shattered traditional Austrian society. In 1933, Engelbert Dollfuss formed a conservative autocracy. In February 1934, civil war broke out between the conservative government and the Socialists, and the Dolfuss government outlawed the Socialist Party. In July, the National Socialists attempted a coup d'etat, assassinating Dollfuss. In March 1938, Germany occupied Austria and incorporated it into the German Reich. This development is commonly known as the "Anschluss" (annexation). The Federal Assembly (Parliament) consists of two houses--the National Council (Nationalrat), or lower house, and the Federal Council (Bundesrat), or upper house. Legislative authority resides in the National Council. Its 183 members serve for a maximum term of four years in a three-tiered system, on the basis of proportional representation. The National Council may dissolve itself by a simple majority vote or the president may dissolve it on the recommendation of the Chancellor. The nine state legislatures elect the 62 members of the Federal Council for 5- to 6-year terms. The Federal Council only reviews legislation passed by the National Council and can delay but not veto its enactment. Since World War II, Austria has enjoyed political stability. A Socialist elder statesman, Dr. Karl Renner, organized an Austrian administration in the aftermath of the war, and the country held general elections in November 1945. All three major parties--the conservative People�s Party (OVP), the Socialists (later Social Democratic party or SPO), and Communists--governed until 1947, when the Communists left the government. The OVP then led a governing coalition with the SPO that governed until 1966. Between 1970 and 1999, the SPO governed the country either alone or with junior coalition partners. In 1999, the OVP formed a coalition with the right wing, populist Freedom Party (FPO). The SPO, which was the strongest party in the 1999 elections, and the Greens formed the opposition. The FPO had gained support because of populist tactics, and many feared it would represent right wing extremism. As a result, the European Union (EU) imposed a series of sanctions on Austria. The U.S. and Israel, as well as various other countries, also reduced contacts with the Austrian Government. After a period of close observation, the EU lifted sanctions, and the U.S. revised its contacts policy. In the 2002 elections, the OVP became the largest party, and the FPO's strength declined by more than half. Nevertheless, the OVP renewed its coalition with the FPO in February 2003. The next national elections will be held on October 1, 2006. The People's Party advocates conservative financial policies and privatization of much of Austria's nationalized industry. It finds support from farmers, large and small business owners, and some lay Catholic groups, mostly in the rural regions of Austria. In 2002, it received 42.3% of the vote. The rightist Freedom Party traditionally had a base in classic European liberalism. However, a mixture of populism and anti-establishment themes steadily gained support in recent years. It attracted about 27% of the vote in the 1999 elections, but only 10% of the vote in 2002. The Alliance-Future-Austria (BZO) split from the FPO in 2005. All the FPO's Federal Ministers and most of its parliamentarians joined the BZO, and that party formally became the junior partner in the governing coalition. The BZO, however, has been unable to draw significant popular support away from the FPO. The Liberal Forum, founded on libertarian ideals, split from the Freedom Movement in February 1993. It received 3.7% of the vote in the 1999 election and thus failed to enter the national legislature. The Liberal Forum will not campaign in 2006. The Greens, a left-of-center party focusing on environmental issues, received 9.5% of the national vote in 2002. Austria has a strong labor movement. The Austrian Trade Union Federation (OGB) comprises constituent unions with a total membership of about 1.4 million--about 40% of the country's wage and salary earners. Since 1945, the OGB has pursued a moderate, consensus-oriented wage policy, cooperating with industry, agriculture, and the government on a broad range of social and economic issues in what is known as Austria's "social partnership." The OGB has announced opposition to the new government's program for budget consolidation, social reform, and fiscal measures that favor entrepreneurs. Austria has achieved sustained economic growth. During the 1950s, the average annual growth rate was more than 5% in real terms and averaged about 4.5% through most of the 1960s. In the second half of the 1970s, the annual average growth rate was 3% in real terms, though it averaged only about 1.5% through the first half of the 1980s before rebounding to an average of 3.2% in the second half of the 1980s. At 2%, growth was weaker again in the first half of the 1990s, but averaged 2.5% again in the period 1997 to 2001. After real GDP growth of 1.4% in 2002, the economy grew again only 0.7% in 2003, with 2001-2003 being the longest low-growth period since World War II. In 2004, Austria�s economy recovered and grew 2.0%, driven by booming exports in response to strong world economic growth, but it declined to 1.8% growth in 2005. Predictions are for the economy to grow 2.8-3.2% in 2006 and 2.2% in 2007. Austria became a member of the EU on January 1, 1995. Membership brought economic benefits and challenges and has drawn an influx of foreign investors. Austria also has made progress in generally increasing its international competitiveness. As a member of the Economic and Monetary Union (EMU), Austria has integrated its economy with those of other EU member countries, especially with Germany�s. On January 1, 1999, Austria introduced the new Euro currency for accounting purposes. Trade with other EU-25 countries accounts for about 84% of Austrian imports and exports. Expanding trade and investment in the new EU members of central and eastern Europe that joined the EU in May 2004 represent a major element of Austrian economic activity. Austrian firms have sizable investments in and continue to move labor-intensive, low-tech production to these countries. Although the big investment boom has waned, Austria still has the potential to attract EU firms seeking convenient access to developing markets in central and eastern Europe and the Balkan countries. Total trade with the United States in 2005 reached $10.3 billion. Imports from the United States amounted to $3.8 billion, constituting a U.S. market share in Austria of 3.3%. Austrian exports to the United States in 2005 were $6.5 billion, or 5.7% of total Austrian exports. The 1955 Austrian State Treaty ended the four-power occupation and recognized Austria as an independent and sovereign state. In October 1955, the Federal Assembly passed a constitutional law in which "Austria declares of her own free will her perpetual neutrality." The second section of this law stated that "in all future times Austria will not join any military alliances and will not permit the establishment of any foreign military bases on her territory." The date on which this provision passed--October 26--became Austria�s National Day. From then, Austria shaped its foreign policy on the basis of neutrality. Austrian leaders emphasize the unique role the country plays both as an East-West hub and as a moderator between industrialized and developing countries. Austria is active in the United Nations and experienced in UN peacekeeping efforts. It attaches great importance to participation in the Organization for Economic Cooperation and Development and other international economic organizations, and it has played an active role in the Organization for Security and Cooperation in Europe (OSCE). Austria has participated in the UN-mandated International Security Assistance Force (ISAF) in Afghanistan since 2002, In August 2005, Austria deployed 93 soldiers to the northern Afghan city of Kunduz to help support the parliamentary and provincial elections. Austria has also participated in international reconstruction assistance efforts and has provided about 8.5 million euros since 2002 to combat drugs, to strengthen women�s rights and for mine removal. Austria's political leaders and people recognize and appreciate the essential role the U.S. played in the country�s reconstruction and in the Austrian State Treaty. It is in the interest of the U.S. to maintain and strengthen these strong relations and to maintain Austria's political and economic stability.